Would you like to see naturally WITHOUT contact lenses and glasses? Are you frustrated with your lenses? Have you been thinking about LASIK for years, but were afraid? Are you active in sports and wish you didn’t have to wear lenses? FORTIFIED LASIK® has been the solution for many people who now enjoy freedom from contact lenses and glasses. People have this procedure for many different reasons: sports, relief from dry eyes or red eyes from contact lenses, or general overall convenience. FORTIFIED LASIK® is an proprietary LASIK invented by Dr Brian Boxer Wachler, one of the world’s leading vision correction eye surgeons. A similar version of this procedure was first developed in Europe. FORTIFIED LASIK® is a combination of Dr. Brian’s advanced LASIK + Dr. Brian’s accelerated Holcomb C3-R® (a cornea strengthening procedure that he invented in 2003). This reinforces the cornea to help guard against unwanted side effects that might otherwise occur without accelerated Holcomb C3-R®. It is well known that LASIK can weaken cornea with the creation of the flap combined with tissue removal to reshape your cornea. In some people this can cause a complication known as Ectasia or Keratoconus resulting in severe vision loss from the cornea bulging out like a hernia. Dr. Brian is known around the world for treating Ectasia and Keratoconus with procedures that he invented. That is the reason he developed Fortified LASIK®. It uses his proprietary crosslinking process (Holcomb C3-R®) to strengthen the cornea at the very end of the LASIK procedure. The crosslinking that Dr. Brian performs at the end of your LASIK procedure minimizes the risk of developing Ectasia or Keratoconus is extremely low. This is the reason strengthening the cornea with crosslinking is very important for your vision. Patients enjoy the peace of mind of experiencing Dr. Brian’s FORTIFIED LASIK® with the added safety that cannot be found anywhere else in the United States. FORTIFIED LASIK® is ONLY available at Dr. Brian’s Beverly Hills office due its proprietary nature. This is the reason many people routinely fly in from out-of-state for FORTIFIED LASIK® with Dr. Brian. It’s just an easy 3-day visit to his Beverly Hills office. Imagine if your LASIK procedure came with an insurance policy…FORTIFIED LASIK® in a sense gives your what you’ve been waiting for – reinforcement for your cornea after the laser treatment that helps “lock-in” all the benefits of the procedure to your vision. Best of all, it only takes one extra minute per eye for FORTIFIED LASIK®. It’s receiving two procedures for the price of one! 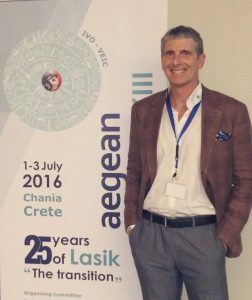 Dr. Brian, a LASIK pioneer, was invited to speak at the prestigious “25 Year Anniversary of LASIK conference” in Greece organized by Professor Ioannis Pallikaris, the inventor of LASIK in 1991. Professional Basketball Player Rudy Gay had a similar procedure to LASIK called PRK. Listen to how Dr. Brian changed his career. Dr. Brian’s advanced LASIK studies that he published in the scientific literature show that wider diameter laser optical zones, which are used for his unique Advanced LASIK, reduced the risk of night time glare and halos from LASIK. This is precisely how Dr. Brian reduces the chances of you having problems with halos and glare from FORTIFIED LASIK® with him. He also published his results in the scientific literature which proved that his unique Advanced LASIK can improve glare and halos from earlier generation LASIK laser procedures that caused these side effects. If you or a friend had LASIK years ago and suffer from halos and glare at night, please know Dr. Brian can very likely help. The LASIK CONSUMER REPORT on the upper right side has been read by over 73,000 people over the past 8 years. Please click on the report on the right to access the report. Dr. Brian has the longest experience of anyone in the world with the laser he uses for Fortified LASIK® – the laser is like “an extension of his hands”. Dr. Brian uses his wholly owned FDA approved laser in his own facility for FORTIFIED LASIK®. He does NOT need to go to an outside, “communal” surgery center for FORTIFIED LASIK® where other doctors go in-and-out like a rotisserie – all using the same equipment which causes greater wear-and-tear on the laser and equipment. Dr. Brian is the ONLY ONE who exclusively uses his laser and equipment. In fact, FORTIFIED LASIK® is ONLY available at Dr. Brian’s Beverly Hills office. This is the reason many people routinely fly in from out-of-state and from around the world for FORTIFIED LASIK® with Dr. Brian. LASIK BASICS – LASIK involves creating a thin flap in the outer layer of the cornea. The flap is carefully moved aside and the laser is used to reshape the cornea. The flap is replaced and bonds without stitches. Right now you might be feeling squeemish. Almost everyone does initially. Dr. Brian’s FORTIFIED LASIK® is typically a comfortable 5 minute procedure that requires no needles or shots, only numbing drops are needed. People typically say having FORTIFIED LASIK® with Dr. Brian was easier than going to their dentist. You can rest easy knowing you’re in the gentle, yet expert hands of Dr. Brian. FORTIFIED LASIK® Combining his advanced LASIK with accelerated Holcomb C3-R® provides you with added safety AND “peace-of-mind”. The potential benefit of FORTIFIED LASIK® is improved vision and freedom in your life from contacts and glasses. The potential risks of LASIK are dry eyes, halos/glare, reduced vision, infection, need to still wear corrective lenses, inflammation, among others. That is the reason Dr. Brian and every staff member here are all highly “detail-oriented” about every step of the process. We take your trust to have Dr. Brian’s FORTIFIED LASIK® with us very seriously. Please click on Important Safety Information button for a complete discussion of generic LASIK benefits and risks. Please note that results may vary for each patient. In general LASIK is not for everyone and we advise that you should talk to your doctor or make an appointment with us to determine if you are a qualified candidate. Even if you are not a candidate for Dr. Brian’s FORTIFIED LASIK® (for example because your corneas are too thin or too mishaped, or your prescription is too high), Dr. Brian will discuss other procedures to help get you to your final goal which typically is freedom from glasses and/or contact lenses. 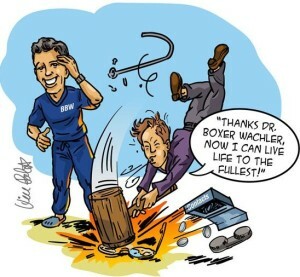 At the Boxer Wachler Vision Institute, we are committed to superceding the average standard of care. That is one reason Dr. Brian was voted ‘One of the World’s Best Laser Eye Surgeons.’ Dr. Brian and his team have published articles in the scientific literature and presented at numerous medical conferences on LASIK results for over a decade. Safety is of utmost importance and we have taken measures to ensure that you will receive a high quality of care available in today’s industry. Are You a Candidate for FORTIFIED LASIK®? To find out, please call the office 310.594.5209 to schedule your evaluation with Dr. Brian. During your evaluation, we will carefully measure your eyes and Dr. Brian will personally meet with you to review the test results and discuss the procedure in detail. WHO is the ideal candidate for Multifocal LASIK? Patients over 40 with blurred distance vision AND blurred reading vision. Multifocal LASIK is expected to help patients see improvement in BOTH reading vision and distance vision. Multifocal LASIK is NOT monovision LASIK (where one eye is strongly corrected for distance vision and the other eye is strongly corrected to reading vision). Living Life to the Fullest with LASIK! What do LASIK Laser & Muscle Cars Have in Common? Click the video to learn.